As SharePoint 2013 is making it way to the developers, solutions get upgraded to SharePoint 2013. Thanks to Keith Tuomi, I will post the source of the problems here. SharePoint 2013 offers the ability to be compatible with SharePoint 2010. In short, this means that a lot of features are ‘double’, one of which is the special reference in IIS to the _layouts folder. In SharePoint 2013, the reference to the 15 hive is “_layouts/15” and NOT “_layouts”. Instead, “_layouts” points to the 14 hive. In short, if you have resources and code relying on server side code and mappings, make sure you update the references to these files to point to the correct virtual directory! One of those things is the fact that the out-of-the-box version of SharePoint 2010 seems to miss certain workflow actions that seem logical. This blog post covers one of those, the in-ability to set a Managed Metadata column. In my current project, we encountered this behaviour when trying to create workflows that modify mms columns. Out of the box, the only way available is to use either the Update List Item or Set Field actions. In both cases however, you need to provide the exact string for the MMS value, in the form of <id>;<value>, i.e. 34;My Value. Not ideal as this could be different here and there and could change in the future. More importantly though, it does not work in all cases. It seems to work fine when no value was set for the column yet, but as soon as it is, you are not able to modify it from the workflow. So I decided to develop a small custom action to overcome this problem and enable us to update MMS columns, whatever their current value is. In this post, I will not go over the entire setup of developing a custom action. Please review my other post on email activities for more info on that. Instead, I will only cover the code needed specifically for this action. As you can see above, the action defines an action with 4 parameters, the name of the MMS column, the name of the term, the name of the termset and finally the name of the group. The other 4 parameters are default parameters that allow you to get the context of the workflow. Now let us move on to the code of the action. Now the real meat to the bone is in the ActivityExecutionStatus method that will be called by our workflow on start. We will first obtain references to the list and current item before proceeding. Once done, we get the MMS column from the item and cast it to a TaxonomyField. We can then obtain the configured TermStore for that column through the field reference. We then setup a TaxonomySession and obtain a reference to the TermStore. From that point on, easy to get the Group, TermSet and Term required for the update. We finally update the item using the SetFieldValue method from the TaxonomyField. This simple action can be extended by allowing parameters from the start of the action to allow the end-user to enter the appropriate term, set and group on start of the workflow. That is however beyond the scope of this blog. Couple of things you should be aware of. If your activity does not show up in SharePoint designer, please check if you created the appropriate language folder in your project for the ACTIONS file. Misplacing this file will cause the activity not to show up. The session object is not very consistent. I found it more reliable to use the term store ID from the taxonomy field to request the TermStore from the session object. When deployed, run the workflow a couple of times. It takes a while for the connections to be setup and running the workflow directly after deployment might cause an exception in finding the TermStore. I suspect the reason why we cannot update a MMS column from a workflow using the OOB actions is because the link to the TermStore fails in doing the update. I have not reveived the OOB code using Reflector or something, but it could explain why it is not posisble. Hope this fills a gap in your requirements! Update: I have updated the code of the email activity to include this activity too. Download the sample solution here! You have probably run into it if you created SharePoint 2010 workflows using SharePoint Designer. The cool part of SharePoint 2010 is that it actually allows you to modify or copy the out-of-the-box workflows. The not so cool part is that the activities in SharePoint Designer are quite limited in their functionality. For example, in the email activity that comes out of the box it is not possible to add attachments, nor does it allow you specify the From field. Fortunately, using Visual Studio, we can upgrade the toolbox for SharePoint Designer activities to add more specialized activities that can then be used in the designer workflows. Sure, it is possible to just create the workflow in Visual Studio, but to me, the hassle of creating a complete Visual Studio workflow, just because you want to change the From field does not make sense. It is not cost effective. SharePoint Designer workflows are powerful and should be part of the evaluation for any workflow solution. It has its limits, but also a lot of strengths. In this post, I will show how to create a custom workflow activity for this purpose. To keep things simple, if possible using this subject, I will only allow for a single attachment. I will leave it up to you to update the activity with multiple attachments if you want to. Before I begin though, if you would like to just buy a lot of additional custom activities for SharePoint 2010, please take a look at the offerings from Nintex. Let’s discuss the contents. The WorkflowInfo node just indications this definition applies to Workflows. The Actions node defines how the text is build up in the workflow designer. For example, if used in a sequential action, the action will read <actiondescription> then. Nothing really interesting there. The real magic starts with the Action node. In there, the attributes Name, ClassName, Assembly, AppliesTo and Category define the name of the action in the actions menu, the class and assembly for the code, if it relates to list items, documents only or all, and the Category in which it is listed in the actions menu. The RuleDesigner node specifies the text shown in the editor and related input parameters. The attribute Sentence specifies the sentence shown in the designer. You specify each parameter by a % followed by a number. %1 will point to the first parameter and so on. The parameters are specified using FieldBind attributes. The Text attribute substitutes the ‘%’ parameter indicator in the sentence in the designer. The Id attribute should match the order of the parameter. The Parameters node and subsections define the parameters that will be passed into your custom activity class. Parameters obtained from the FieldBinding should exactly match the parameter names in the parameters section for them to be transferred to your code. You also specify whether your parameter is in or out and the type of the property, which is a .NET type. For more information on Workflow Action files, see MSDN. So now we have our ACTIONS definition file. Let’s move on to the code itself. Add a new class to your project. Call the class SendEmailActivity as stated in the ACTIONS file. Have the class inherit from the System.Workflow.ComponentModel.Activity class. That is the easy part. 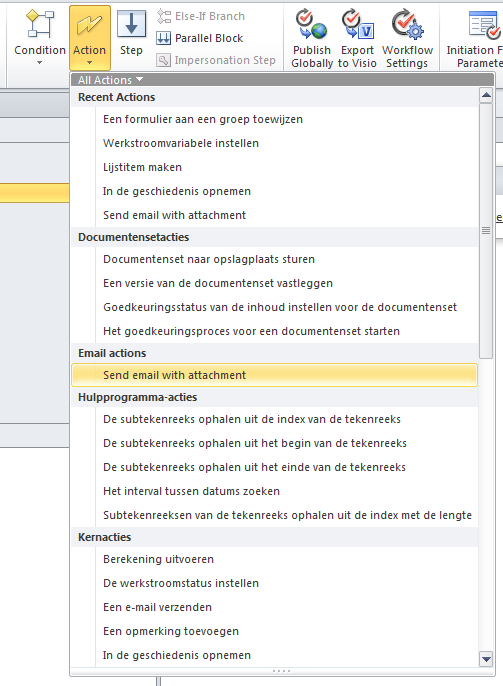 Now for each of the parameters we stated in the ACTIONS file, we need to create properties and ensure that they map. First do the Workflow Context properties. They use a DepencyProperty to map the property in the class to the parameter stated in the ACTIONS file. See below code snippet. What is important here is that the name of the DependencyProperty is equal to the name of the property in the class, appended with Property. Also, the name of the property should be equal to the name of the parameter in the ACTIONS file. Now that we have these properties, we also map the rest of the properties that are more relevant to our solution. To walk through the method, we first get the current web through the Workflow Context. We then use a couple of helper methods to build the mail message (BuildMailMessage), get the SMTP information from SharePoint (LoadSmtpInformation) and get the mail address of a user if it is passed as an account name (GetMailAddress). Please review those methods yourself if needed. Please note the LoadSmtpInformation method. It requests the outbound server address from the WebApplication. Be aware that multiple SMTP settings exist in SharePoint 2010 and that you can specify the outbound server both on server level in Central Admin and for each web application separately. In our case, we use the latter. After we created the message, we try to load the attachment specified by the property. To do that, we use the AttachmentFileName property to open the SPSite where the file resides. We then open the SPWeb and use the GetFile method to load the file into a SPFile object. Finally, we use a MemoryStream to add the attachment to the mail message. The rest of the method is to assign the From and To mail addresses. You can further expand the activity to also include CC and BCC addresses if you wish. This will add or remove an authorizedType node to your web.config file, enabling SharePoint to use the action in SharePoint Designer workflows. To ensure that SharePoint will safely load our custom activity, we add a SafeControl entry to the web.config. We do that by overriding the Package.Template.xml to include our SafeControl entry. Also note we use the VS ability to inject the assembly details on build. You can do a lot with the reusable workflow abilities in SharePoint Designer 2010. However, the best part is that you can extend the capabilities that the OOB version has, which makes the SharePoint workflows far more likely to be used as they can be tweaked. A definite improvement over SharePoint 2007 where they were as they came. Have fun building your own! At my current client, we encountered an issue with some of the custom search web parts. In these web parts, we would perform a custom FullTextSQLQuery against the search index using the Like statement against custom created managed properties. Somehow, the search did not return any results, no matter what the keyword was. This behavior was kind of strange and indicated that there must be something wrong with the creation of the managed properties, or the population of these properties. Several steps were taken, like again executing a full crawl, remapping the managed properties and so on. Still, the search did not return any results. This drove me a little bit nuts until I found a post in the social MSDN by Steve Curran. It turns out, Microsoft changed the behavior a little bit since SharePoint 2010. Managed properties on SharePoint 2010 have an additional setting called ‘Reduce storage requirements for text properties by using a hash for comparison’ that influence the way the query behaves when using the Like statement (or the contains statement for that matter). If not checked, any Like comparison against this managed property will always return null, no matter what you put in. Checked this setting, ran a full crawl again and search was working fine. It has been a while since my last post, all due to delivering my current project. In the next few posts, I would like to share some learning that I obtained during this project, in which we delivered an Intranet site based on SharePoint 2010. This post is about User Profile synchronization, in particular using the Business Connectivity Services to complete the User Profiles in the store. This post will not go into how we would configure the User Profiles to sync using BCS, and in our case the Secure Store, but will talk about a particular error message you could encounter in FIM. If there is interest in such a post, please leave a comment. So what is FIM? FIM stands for Forefront Identity Manager and is the driving force behind the User Profiles within SharePoint 2010. It uses two windows services that are connected to the SharePoint 2010 service applications. When you open up the FIM client on the server (C:\Program Files\Microsoft Office Servers\14.0\Synchronization Service\UIShell\miisclient.exe), you might find the following error at one of the synchronization stages: “stopped-extension-dll-exception“. If you look in the event log, you might see some errors stating exceptions of ” “NoSuchObjectType” or “object user not found” or similar. So what is going on here? Basically, there could be many things, but this post only describes one possible solution to your problem. You should always verify that the FIM windows services are running; that is step 1. In my scenario, I was updating the User Profile with information from a BCS entity that pulled data from a database. In my case, the cause for this error was the incorrect security setup of the entire chain. So from the Secure Store Service through the Business Connectivity Service down to the User Profile service. Any misconfiguration there can lead to this brilliant detailed and descriptive error message. Ensure that the account the User Profile Sync (so your FIM services) has access to the Secure Store Application and is allowed to execute them. Seems simple and it is, but easy to overlook. In principle, the easiest way to check if all the security settings are applied correctly is to create an external list using the BCS entity and log on using the same account the FIM services are running. If setup correctly, you should see the data from your external content type. If so, the User Profile service should be able to use it and as such, can perform the synchronization. If not, then your security configuration is not correct and your synchronization will fail with above error message. Hope it will help someone! I will try to make some more time in the near future to write up some of the learnings.